This is an inevitable event that happens to all men. 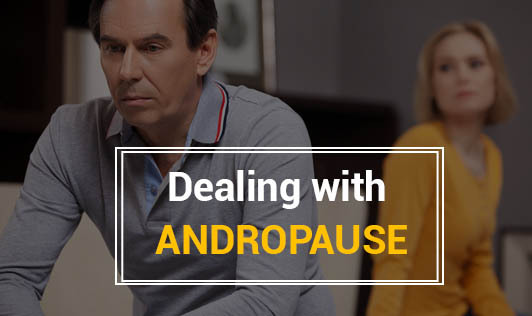 As men age, they experience a phenomenon which is similar to female menopause, called andropause. Usually, by the time a man reaches the age of 30, testosterone levels begin to drop by about 10% every decade. Not all men experience it, and it doesn't include a complete shutdown of the male reproductive organs, although sexual complications may arise due to lowered hormone levels. Each man's symptoms may be different and it has been shown that a man's physical and mental wellbeing can play a part in deciding the degree of signs and symptoms. Those who eat right, exercise on a regular basis, and are content with life, seem to experience symptoms to a lesser extent, when compared to those men who are overweight, physically unfit, or depressed. Get Moving: Exercise regularly. This is not only a great remedy for depression but is a hormone-builder as well. Eat Right: Cut back on fried foods, saturated fats, and sweets. Eat a well-balanced diet. Talk: Talk to others who may be experiencing what you are feeling. You can even go to a therapist for some advice. Take Charge of Your Life: You are responsible for living a healthy life. So, take charge of how long and how well you live. Think Positive: Maintain a positive outlook towards life.